Buy Rhodium bars from Suisse Gold. Rhodium is a platinum group metal that has only recently become available to retail precious metal investors as a bar. 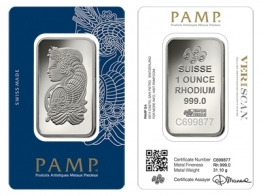 1 Ounce Rhodium bars are available for VAT-free Swiss storage or delivery.